Starting a tree trimming services business can get you on the path to a secure financial future if you have the creativity and tenacity necessary to be a successful entrepreneur. Here are a few secrets to improve your startup process. Thinking about opening a tree trimming services business? We tell you what you need to know to get started. Tree trimming services fall squarely in the residential and commercial landscape services category. But due to the fact that tree trimming and removal requires a specialized skill set, few general landscapers provide tree trimming services, creating opportunities for countless numbers of tree trimming entrepreneurs to fill the marketplace. A typical day for a tree trimming entrepreneur is filled with activity and potential danger. 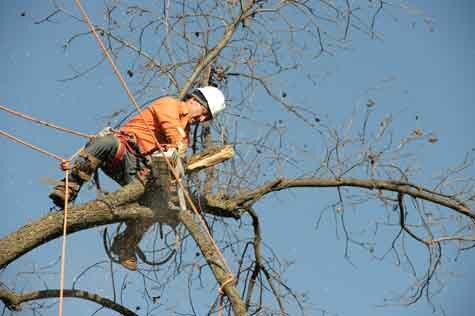 Tree trimmers are typically required to ascend into tree canopies to thin branches or remove entire portions of trees. Although some jobs may require the use of a crane or bucket truck, most of work will be performed with a harness and tree climbing gear. On any given day, tree trimmers may also be called upon to grind down stumps or even perform pruning, fertilizing or planting activities to promote healthy tree growth. So in addition to being an expert in tree removal, you will also need to have a solid grasp of tree health and arborculture. Competency. If you have never trimmed trees before, you really have no business starting a tree trimming service, at least not now. Rather than jeopardizing your reputation (and possibly your life), get industry experience and recruit a mentor who can familiarize you with industry practices and techniques. Safety. Simply put, there is no room for shortcuts in the tree trimming industry. Safety must always be your business's first priority, starting with strict adherence to OSHA and industry safety standards. For the safety of your workers and your customers, you need to implement equipment inventory routines that ensure your gear is always in good working order. Insurance. Unfortunately, strict safety practices can't provide 100% accident protection. Accidents can and will happen occasionally, so you need to protect your business and personal assets with a robust business liability policy. To be effective, your policy will also need to cover damages that may occur to your customers' property during the course of business. A good business plan establishes both a framework and a roadmap for your business. If you don't have a business plan, your leadership will be handicapped, making decisions that could be detrimental to your tree trimming services business's values and long-term goals. Start by defining your business mission. The process of writing a mission statement doesn't have to be complicated. With a carefully crafted mission statement in place, you can begin to build on it with goals, budget estimates, marketing plans and other elements that are typically found in startup business plans. Long before you open a tree trimming services business in your town, it's essential to determine how you will fit in the competitive landscape. Try our link below to find competitors near you. Simply enter your city, state and zip code to get a list of tree trimming services businesses in your town. If you are interested in starting a tree trimming services business, it's a smart move to talk to somebody who is already in the business. If you think owners of nearby tree trimming services businesses will give you advice, think again. It'd be crazy for them to teach you the business. Fortunately, somebody who runs a tree trimming services business on the other side of the country will be much more likely to talk with you, provided that you won't be directly competing with them. Indeed, many experienced entrepreneurs enjoy offering advice to startup entrepreneurs. In my experience, you may have to call ten business owners in order to find one who is willing to share his wisdom with you. Want the scoop on finding somebody who runs a tree trimming services business in another city who you can speak with? On a percentage basis, more entrepreneurs intend to enter tree trimming services business ownership through a startup than through a business purchase. Yet tree trimming services business startups aren't easy - many fail within the first year. There are a lot of factors that need to be considered in buying vs. starting a business. By buying a profitable tree trimming services business, you'll shorten the amount of time it takes to achieve a return on your investment because you'll have the advantage of a proven operation and an existing customer base. You should know that your odds of doing well with your venture immediately improve when you opt to franchise in lieu of doing everything yourself. Before opening a tree trimming services business, it's worthwhile to assess whether franchise opportunities in your space might be worth investigating. What do you have to say about starting a tree trimming services business? Post your comments on this topic using our comment submission form below. Are You Already a Tree Trimming Services Business Owner? Do You Sell to Tree Trimming Services Businesses?